We updated our list of best water shoes for snorkeling for summer of 2019. Aleader's rubber-soled women’s water shoes are designed for maximum water drain while allowing your foot to breathe. Its midsole is made from solyte material that gives you an exceptionally lightweight feel with an excellent bounce-back factor. As with regards to the outsole, it is hollowed creating holes that will provide extra traction especially in areas that are predominantly wet and has a slippery environment, such as rocks that are overgrown with algae and seaweeds. 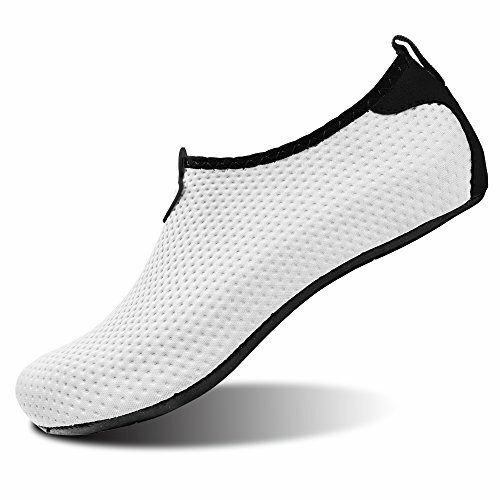 Many of Aleader users have appreciated its shoe covering that is made of breathable fabric and durable air mesh that allows water to drip out instantly. The “ComforDry” sockliner will give you optimum cushioning while creating a cooler and drier shoe environment. This is further complemented with its open mesh on the upper and hole in the sole. With excellent traction in the sole as well you won’t slip on the boat or walking on land. There is a breathable air mesh for the foot to breath in the hot heat. The Water Shoe has a comfort dry sock liner that add extra cushion and dries as fast as you do in the sun whether it is shining or not. Aleader women's shoes come in 5 different colors and lots of sizes to fit everyone, even kids if they have a bigger foot for a child. With so many options and being lightweight they fit great in the suitcase and don’t weigh a thing and will also fit great in your snorkel gear bag. Full enclosed and breathable these shoes allow you to wear them from the dirt to the sand to the water and then to throw your snorkel fins on and away you go. I would recommend wearing these with open heeled fins though unless you have a perfect fit for a closed heel fin. The VIFUUR water sports shoes claim to offer full functionality for the fraction of the price of many other brands. The maker says they are quick dry, breathable, and non-slip, suitable for whatever you may want to do near or in the water. The shoes come in no-frills packaging and are out and ready to go right away. VIFUUR says that the shoes slip on easily and dry quickly, and offer breathable, comfortable protection and performance for a wide range of activities such as boating, swimming, windsurfing, and practically anything on a beach. To test this, they were used for prolonged periods of time around the pool, beach, and in the water. Getting the shoes on was easy. They really do slip on, even when they are completely dry. There was no painful shifting around that had to be done before they would slide into place. Once on, the shoes offer a snug fit, but one that is not too tight. They did require a bit of a break in to stretch out and fit correctly. Once this was done, there was no discomfort caused by pinching in the toes or compression around the ankles They offer enough give so that they can fit a variety of different foot widths. They are advertised as barefoot shoes that feel like socks. Although they feel a bit heavier than your average pair of socks, the claim is not that far off. They feel light on your feet, and you’ll feel like you’re halfway between wearing shoes and being barefoot. During intense activity, the VIFUUR water shoes offered excellent performance, no matter what the event. They are flexible, allowing for easy, free movement in water and on the beach. They have good grip, meaning you won’t slip on treacherous wet surfaces, such as the deck of a boat. On a hike over wet stones, they never lost traction, and allowed for free and flexible movement over rough terrain. Over hours of continuous use, they did not chafe or cause noticeable discomfort, a common problem for many competitors. The fit is tight enough that the foot does not slide around, nor does water pool inside the shoe. They also offered proper temperature regulation in colder waters. Although they can’t protect you completely from frigid temperatures, you’ll notice a significant difference if you put your feet in the water barefoot. Many aqua shoes sacrifice protection for mobility. Here, that’s not an issue. Moving over sharp, uneven rock, the VIFUUR shoes kept feet from being scratched and cut. They’re still lightweight and thin, so they breath well and don’t feel like they’re slowing you down. Once you’re out of the water, the shoes dry quickly and evenly. This gives them a lot of versatility as you can use them for swimming or sailing, and then transition to land-based activities such as hiking without walking around with soggy, cold feet. They wash off easily, and sand doesn’t cling to the outside of the shoes as you try to wash them off. The VIFUUR shoes feature a reasonably simple, functional design, and that is far from a negative. They value minimalism and performance, meaning the shoes are light and don’t get in your way, no matter what you’re doing. However, when it comes to color, you have a lot of options, from a clean black look to a bright, galaxy design. This versatility means you’ll likely be able to find one that works for you. VIFUUR retail for a very competitive price in this market. This is one of the best deals out there, and there aren’t many competitors who can offer a similar product in the same price range. With a wide range of styles, full functionality and high-level performance in multiple areas, and an affordable price tag, the VIFUUR water sports shoes are one of the best options out there for water sports shoes, all things considered. Many other brands offer shoes that are quick-dry, comfortable, breathable, or affordable, but few offer all four. The VIFUUR shoes are not quite as stylish as some higher cost brands, but these may cost you ten times as much, for essentially no upgrade in performance and a slightly better look. It’s hard to go wrong with VIFUUR aqua shoes, no matter what water-based activity you are buying them for. They’ll give you great grip on a boat, protect your feet on the beach, and dry quickly once you’re out of the water. They are best in class, offering an incredible value and great performance at very affordable price. There’s little that you could do in another pair of water shoes that you could not do with VIFUUR. Made by one of the oldest makers of aquasports apparel, the Speedo Women’s Surfwalker 3.0 Water Shoe is the company’s emblem for full foot protection against rugged water environments. Regardless of terrain, slippery and wetness factor, most of the users of this particular footwear has felt total comfort. This is courtesy of its stretchy pull-on upper that has a mesh insets that gives a quick-dry breathability plus providing a secure fit. As far as the internal feel of the footwear is concerned, it has a cushioned insole that provides great protection against friction and impact incase when you need to jump. Further, it has a comfortable slide sandal that is embedded with a seaweed massage footbed which makes every step you take a relaxing one. The footwear is also built with the new “S-TRAC TPR” outsole technology that streams away water from the footwear. This in turn enhances the surface contact of the footwear which many have considered this foot accessory as a great shower shoe as well. 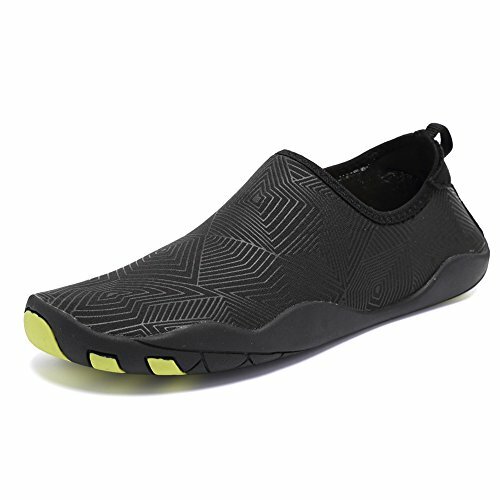 Fabricated using a lightweight mesh and a midfoot webbing system that has an integrated and breathable slip-on that gives an overall supportive fit, Zhuanglin is one of the popular slip on water shoes that is made in China. When we take a closer look, it seems that it has features that makes these shoes looks more like a running shoes. First, it has shoe laces that can be tightened or loosened depending on your preference. Second, it has a thick sole where some have appreciated this property and even claimed that running on a sandy shore guarantees no problem. Third, this footwear has a soft cushioning and a breathable “RB-Eva” outsole with articulated flex grooves that offers a plush comfort. 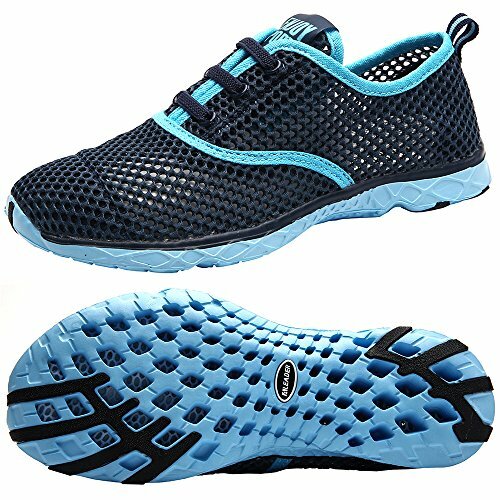 And lastly, similar with lightweight running shoes, the Zhuanglin Women’s Water Shoes has an aqua mesh that filters out sand and small stone without entering the internal parts of the footwear. Most of its users have claimed that these are perfect for walking in the shallows. Many have argued that pebbles and sand will not go inside the footwear and is left behind and stuck in the aqua mesh. Just make sure to take off the stuck pebbles or sand during rinsing as it can possibly damage the material when left untouched. Considered as a bestseller as far as women’s water shoes are concerned, the Viakix brand has been designed for comfort and fit especially when it comes to the contours of a woman’s foot. Its durable sole has a soft, thick but flexible rubber sole that will give you the best foot comfort regardless of surface topography. 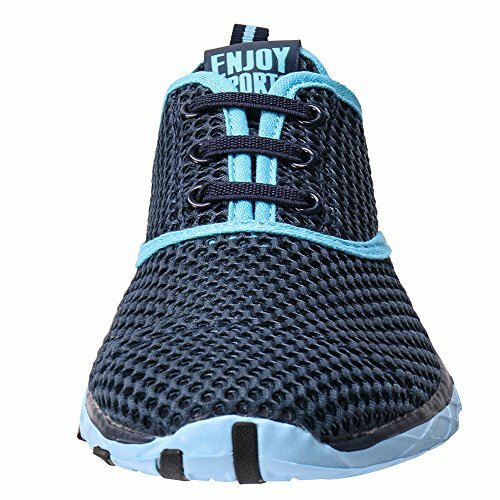 It’s trademark “Quick Drying Mesh” dries more quickly as compared to other women’s aqua shoes which significantly reduce moisture that will lead to foot irritation. In general, these features allows its users to have a comfortable wear while on land or in the water. This is brought to you by its high-quality design that includes breathable mesh and lightweight cushioned insoles. While it seems that this footwear is soft and gentle on the foot, it is also highly durable and flexible that it can be used in any aquatic ecosystem: may it be you are walking on the beach, strolling along intertidal areas or dipping on the mudflats of a mangrove forest. Aside from being one of the most colorful options, the Avadar Women’s Water Shoes is also one of the sought after footwear for female outdoor enthusiasts. They are made from premium fabric that is composed of 92% rubber and 8% spandex making it highly flexible while giving you maximum grip on slippery environments. Upon wearing, you will have a lighter, softer and flexible feel where most of its users have tested this Avadar on the most rugged terrain. Located on the sides are seven drainage holes that acts as water funnel making the entire water shoe dry easily which creates a cool and dry foot surrounding. While the sturdy rubber soles may give you an initial impression of a hard surface, but once you start walking, you will appreciate its light and soft texture courtesy from its ultra soft shoe pad. The durability and flexibility of the Avadar shoes have become the perfect footwear for surfing, wakeboarding, sailing, boating and has even become one of the best water shoes for snorkeling. Some have even tried this footwear as a running shoes. However, we warn you that this is not designed for running and walking in long distances on land, otherwise it may cause wounds and blisters due to the constant friction of your dry feet to the footwears’ material. On the other hand, we would instead recommend wearing this footwear when you are washing your car. By reading the name of this particular model, it will give you an impression that this is one of the best aqua shoes as far as draining water is concerned. This is brought to you by its 14 drainage holes found at the bottom of the sole. This means that in every step you make, water will automatically drain out of the footwear. 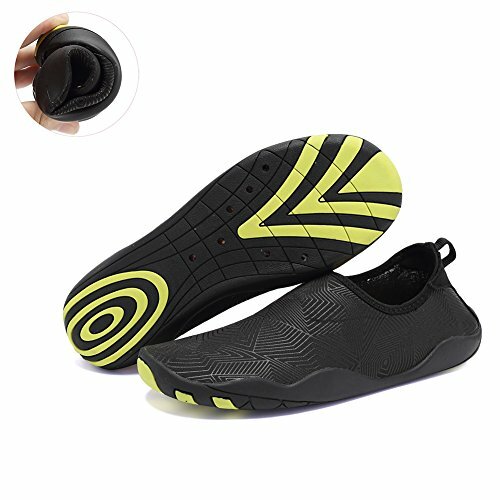 Made from 92% high-grade polyester and 8% spandex, the Cior Women’s Barefoot Quick-Dry Water Sports Aqua Shoes with 14 Drainage Holes is one of the sought after women’s snorkel shoes in the market. This is due to its rubber sole that has a comfortable and thick foam arch that is considered a vital foot support when walking, especially on an uneven pavement. The smooth fabric allow foot breathing and the soft neck further prevents chafing when you want to wear it in the water. 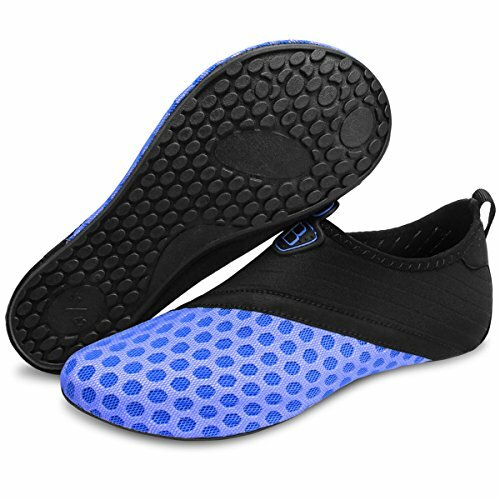 Since it has a thick sole, many have asked about the weight of the Cior Women’s Barefoot Quick-Dry Water Sports Aqua Shoes with 14 Drainage Holes when soaked in the water. There is no direct value as an answer to this question but many have said it is lightweight and conforms to the contours of your feet as if you are walking on barefoot. Are you ready for the comfiest water shoe you will ever have on in your life? Look no further because this is it! Simulating the barefoot design with protection and safety from external objects you will be ready to hit the beach, go hiking, surfing, even yoga will leave you feeling more stable and comfortable. The shoes are comprised of 92% and 8% spandex and that is the reason they are so comfortable. There are 14 small holes for water to drain out of the sole leaving your foot dry and happy. It will allow for more airflow and breath ability to your feet. The sole is strong enough to protect you from rocks, sticks and anything else you can throw at these aqua shoes but flexible enough to think you are not even wearing the shoes. They are durable and have a foam arch that does give you some arch support whether you are flat footed or highly arched. 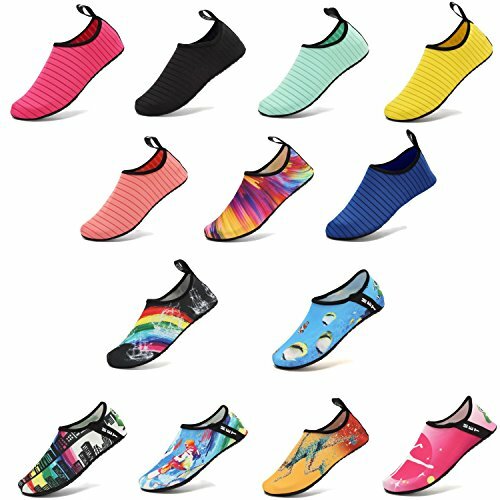 They come in a wide variety of colors and sizes for any foot size, even suitable for kids and men so no need to worry with different colors. The moment you open the packaging upon delivery or see the picture, one of the first words that you will utter is “This is a river sandal”. However, as you slowly scrutinize Keen footwear, you will realize that these are shoes designed and used by women who have already experienced their adventure of a lifetime. The designers of the Keens have placed a heel strap and a quickdraw elastic cord that will ensure that you don’t lose this footwear even if you walk against a rushing water. Instead of the typical aquamesh a water shoe has, the Keen Women’s Whisper Sandal has a polyester webbing that is treated with antimicrobial reagents that will prevent your feet and the footwear from emitting foul odour. The sole is made from hard black rubber which is pretty much similar to a hiking boots. But unlike the typical metal sole end a standard boot has, this particular footwear has a light and soft plastic at the end which will provide you comfort, especially when it comes to walking or hiking in long distances along the riverbed or just at the beach. The only downside we experienced with the Keen Women’s Whisper Sandal is that sand and sediments can easily come in contact with your foot as there is no mesh protection surrounding the footwear. However, on the positive side, this open foot feature will come in handy when it comes to cleaning and rinsing the shoe. 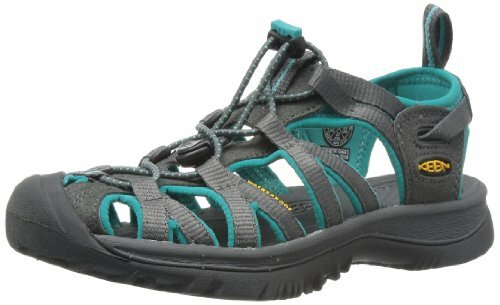 Our number 1 pick for comfort, style and durability is the Keen Women’s Whisper Sandal. First of all it comes in 34 different colors so I can guarantee you, that you will be the only person at the beach with that color looking that good. Even though they are more technically a sandal they work great for being in the water and playing around so no need to worry! Keen water sandals have a hydrophobic mesh lining and non-marking rubber outsole for fast drying and protection with a polyester webbing. The rubber sole has contours and grooves which makes it great for walking on all kinds of surfaces including dirt trails, sand, tennis courts. The bungee lace system makes putting these on and off quick and easy. I would not recommend using them for snorkeling as they have a strap in the back that allows for more air to your heel, the surface area at the back is not strong enough to support a snorkel fin to prevent blistering. Also if you are walking around in the sand, you may get a bit underneath as you will with almost any shoe anyways, make sure you give them a quick rinse once you are back on harder, not sandy surfaces. We can safely say that major features of the Barerun snorkel shoes resembles those of the ninja! The soles are ultra lightweight and highly flexible making it perfect for walking in uneven topography. In can easily be worn courtesy from its smooth neck design that prevents chafing even if you want to wear or take it off underwater. This compact and lightweight design has earned this particular footwear one of the best shoes for snorkeling since it easily fits any open-heel type of flippers or diving fins. After initial examination of the L-Run, you will be confused if these are water shoes or water socks. 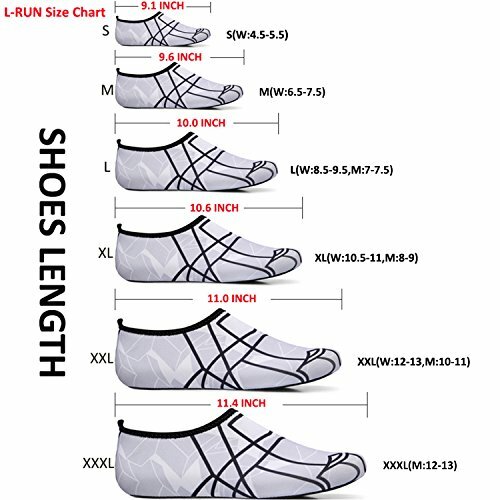 Regardless of which is which, both the characteristics of a shoe and sock fits the description and features of the L-Run Unisex Water Shoes. Socks are thin and so does are L-Runs. Shoes have soles and so does this footwear. In reality, the sole of this particular model is so thin and flexible that it can be folded like a sock. 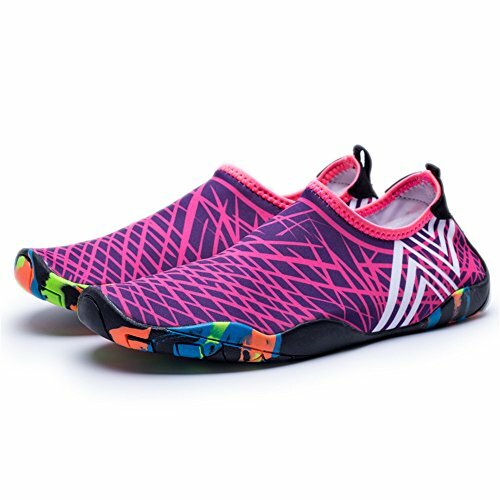 But what is important to discuss is whether this is a sock or a shoe, but rather it latest innovation that is being introduced in to this water shoes. 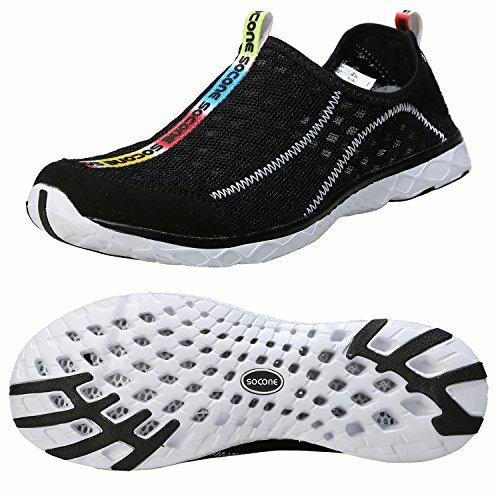 L-Run features the “L-Run anti-skid” ultra-lightweight and breathable outsole that dumps water out and quickly dries up. The shoe mouth is very elastic that it can be stretched out to fit a large foot and goes back in to place creating a tight seal on the ankle. Moreover, the design of this footwear ensures that your foot is free from sand and debris when you are walking or strolling on the beach. The snuggle fit of this footwear has allowed them to be used in most aquasports. Mind you, some have even prefer them to be used during their yoga session where they need a tight grip on the ground or on their yoga mattresses. Of all the water shoes we have presented, we could say that this footwear is one of the most durable. This surf-inspired water shoes features a quick-zip closure that gives you a secure fit especially when you ride along and surf with the waves. It is made out of a quick-dry fabric and a mesh for breathable comfort. This is also one of the water shoes that will give you the maximum traction courtesy from its trademark S-Trac outsole that evenly disperse water when exposed to such. 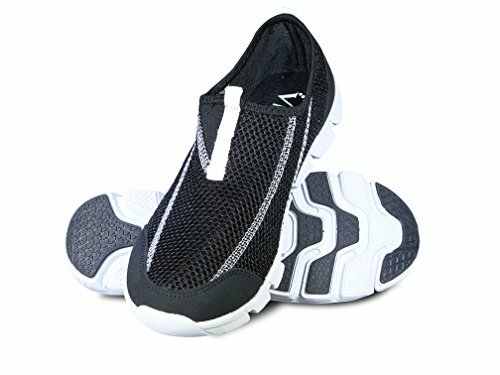 Based on reviews and as confirmed based on actual usage of the footwear, the only problem we encountered with Speedo Women’s Zipwalker 4.0 Water Shoe is that sand and other debris will always enter the shoe, and once its inside, the only way to get rid of the sand is by taking off the footwear. 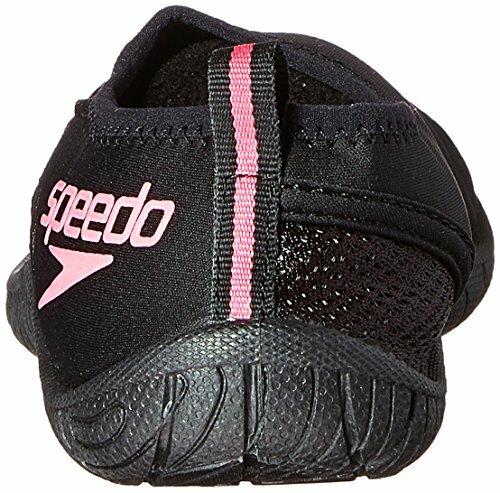 For years Speedo has been at the top of the water sport and accessory game and they keep proving why with this women’s water shoe. Great for hiking to swimming and snorkeling. It has a durable 4 way stretch to conform to any foot size and is great for those open heeled snorkel fins because of the extra comfort. It won’t let that heel blister so you can enjoy the water for hours and hours as long as you have reef safe sunscreen on so you don’t get burnt and protect the water you are in from Belize to Seychelles. The strength and quality is great on these shoes with the S-trac outsole will give you not only great traction but also protection from the hot sand and any rocks or sharp objects in the ocean/lake or wherever you may be enjoying the sunshine. There is a convenient zipper to fit snug your foot properly. It comes in 4 colors and lots of size to fit everyone’s needs. It is a great price and lightweight so no need to worry about weighing down your suitcase or hauling more heavy accessories to the beach! Not unless you have a thick-soled feet that is capable of walking on rocky shores with spiny protrusions without feeling pain, then you don’t need to read this article. However, most of us have soft-soled feet that walking on our favorite beach destination requires some foot protection and this is where water shoes comes in to play. But not just any shoes like sneakers or any footwear that we use on a daily basis, not to mention high-heels. Also known as aqua shoes, water shoes are a special type of footwear designed for water-sports or activities where your feet are most likely to become wet. Some of these aquasports where water shoes are worn include scuba diving, snorkeling, kayaking, mountaineering and spelunking to name a few. Compared to flip flops, some would prefer water shoes when they go for a beach walk where they are guaranteed full foot protection, especially with broken metal and glass pieces. Differentiating from your standard shoes, water shoes does not have a heel, tongue, eyelets and shoelaces. The absence of this typical shoe components qualifies water shoes to be categorized under the step-on category where all you need to do is insert your feet. 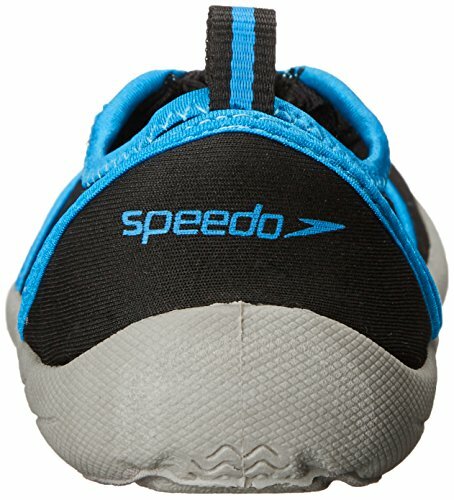 Are water shoes water resistant? No, they are not. Despite being a non-water resistant footwear, many of its users prefer to wear them because of their design and material. They are generally made of a hard sole that prevents sole penetration from any rocky or spiky objects. Aside from the hard sole, water shoes are covered with a neoprene wrap or lycra that allows water to flow out of the footwear. Given the fact that water shoes does not have some of the features a typical shoe has ,like shoelaces which can tightened or loosened depending on the shoe size in relation to the size of the feet, water shoes has a different kind of fitting. Speaking of our typical shoes, we often buy a larger shoe size of about 1 to 2 inches bigger than our actual foot size. This is especially true when we buy shoes for our young ones where there feet grows relatively fast in a short span of time. And to compensate for the size allowance, we do it by wearing socks. But with water shoes, we don’t wear socks, otherwise we will dampen our water shoes with water making it heavier to use and walk. As for water shoes, we still do need an allowance with reference to our foot size, generally 0.5 - 1 inch bigger. But the reason for this has nothing to do with size allowance for foot growth, but rather for water shoe shrinkage. Most water shoes will shrink overtime and the degree of shrinkage will depend on the frequency of usage. Reminder: Do not buy oversize water shoes. Most of us are tempted to purchase oversize footwear as they are often on sale with huge discount on hand. If you do so, it will jeopardize your foot’s safety and your safety in general which is the primary reason why you bought water shoes. Further, do not buy undersize water shoes. The same is true with oversize footwear where they are often on sale, having a small size water shoe will bend your toes that can possibly lead to muscle cramps, thereby giving you discomfort rather the comfort and safety you need. Why Water Shoes? Which Shoes to Choose? As mentioned above, water shoes and running shoes are not the same. The reason first and foremost is in the material which I will talk about later but always the best reason because you need something that is quick drying. Next they will provide you with protection, which is a huge advantage because then you are not restricted to the sandy part of the beach and you can go hiking to certain areas or if there is a rocky or hard spot to walk in through the water and you cannot swim this is a great opportunity to get to those hard to reach spots that may open your eyes to magical snorkeling that you never thought possible. Water shoes are great for day to day use, from walking on the hot sand and depending on which water shoes you get they can be so versatile in which you can go hiking, surfing, and so much more without changing your shoes and they will dry fast and not smell up your hotel or beach house! When buying anything you need to ask yourself what are you going to use it for? 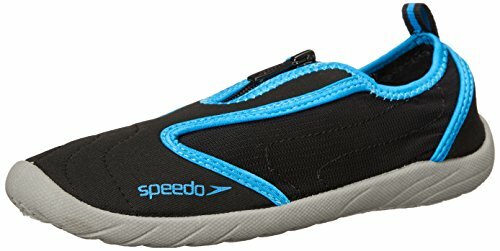 If this is primarily for walking around and doing other outdoor activities you may want to get a water shoe that is more like a running shoe or active shoe like the Speedo Women's 4.0 Hydra water shoe (look below for a full report). This shoe allows you to do all of your outdoor activities then run into the water no problem. If you are looking for more of a true water shoe that is going to be used once you head onto the sand, into the water and back you may want to go with the Speedo Zipwalker that provides great protection in the water and is quick drying and low cut so it won’t leave weird tan lines! If it is more of a snorkel sock or liner I would recommend CIOR water shoes and are lightweight and feels like you are not even wearing anything at all and great for open heeled snorkel fins. There are lots of options and you need to find what works best for you. Looking at different kinds of material most water shoes are made of Lycra and Neoprene along with a rubber style sole for protection. This allows for breathability and comfort when you are in the water and they will not lose elasticity after years of use. Make sure if you are in the salt water rinse the shoes or water socks off in fresh water so you do not leave a residue or smell. This is a newer product that you may or may not have heard of. They are a special sock made of Lycra or neoprene that are designed to go in your s﻿﻿norkel fins﻿﻿﻿﻿﻿. Usually you can have and open or closed heel and they work great for blister protection. If you use them for closed heel fins make sure they are going to fit with your fin, have an extra half size just in case and with open heeled fins you should not have any issues! You might think a shoe is a shoe regardless of what you are doing with them, walking, running, swimming perhaps, well unfortunately each specific activities needs a particular shoe especially when it comes to water shoes. 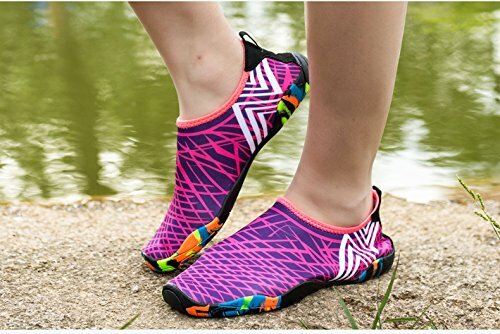 You need women’s snorkeling shoes, water shoes for support if you are going to be active with the shoes as well and our favorites being the speedo aqua shoes. Each shoe will perform differently especially if you go from snorkeling with water shoes to hiking and even just getting into the water so you don’t burn your feet. I know this seems like a lot but the good news is, through this article I will go over the do’s and don’t for women’s water shoe buying and how to pick the right one so you don’t get hooked for a bad water shoe! For starters the most significant difference between a regular running shoe and a water shoe is going to be the material. 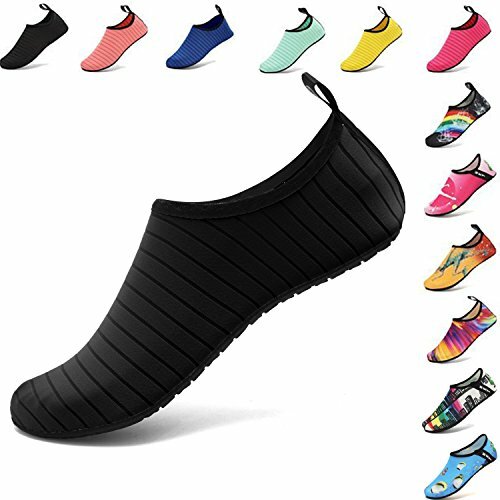 Nowadays most shoes quite light to begin with so you really don’t have to worry about weight unless you are getting a snorkeling sock or multi-use water shoe for snorkeling and walking. Regular running shoes are going to be comprised of leather, mesh, hard rubber, cotton and sometimes a mix of everything. The bad news is that the fancier the shoe is probably the less resistant it is to all weather conditions unless they are a rain boot or snow boot. That is bad for totally submerging your shoe in the water because the shoe won’t dry properly and most likely have a smell that will be very difficult to get rid of! When you think of a regular running shoe it is comprised of three components: the Upper, midsole and outsole, Click here to learn more. Then there is the stability for people who are flat footed, pronate and supinate. Without getting into the specifics of running shoes, water shoes are primarily meant to dry fast and keep you safe. They have also created water shoes that can be used for hiking and outdoor activities like tennis and biking. They are obviously not as specialized as a tennis or hiking shoe would be but they are very comfortable and your first priority is drying fast so you need to take what you can get. Womens water shoes will usually have a rubber sole for fast drying and a breathable mesh layer on top so it won’t hold the water in and will keep your feet from staying moist throughout the day. The biggest component is the quick drying materials that allow for air to breathe to your foot and protect you from sharp objects in the water and blisters when you are snorkeling. At the end of the day, water shoes are just water shoes and they are worn primarily to protect our feet. However, always remember that the first factor in choosing the right water shoes for you is not the brand or design, but rather “comfort and fit”.